A short while back I took on pro bono logo design project for AC Academy, which is a London academy for children to take part in choir singing. The logo was primarily to be used on the front of the 100’s of white t-shirts that the children wear, when singing and performing at the Royal Albert Hall, most notably with Russell Watson. The general idea of the logo design is that there are two spotlights crossing each other and illuminating side profile of a child singing, which is cut out of the lights beam. I can’t say enough what a thrill it is to see the logo design on such a huge and epic scale, and at such a prestigious event and venue. Very proud. Here are some photographs taken from the most recent choral performance, from the children of AC Academy, along with Russell Watson. 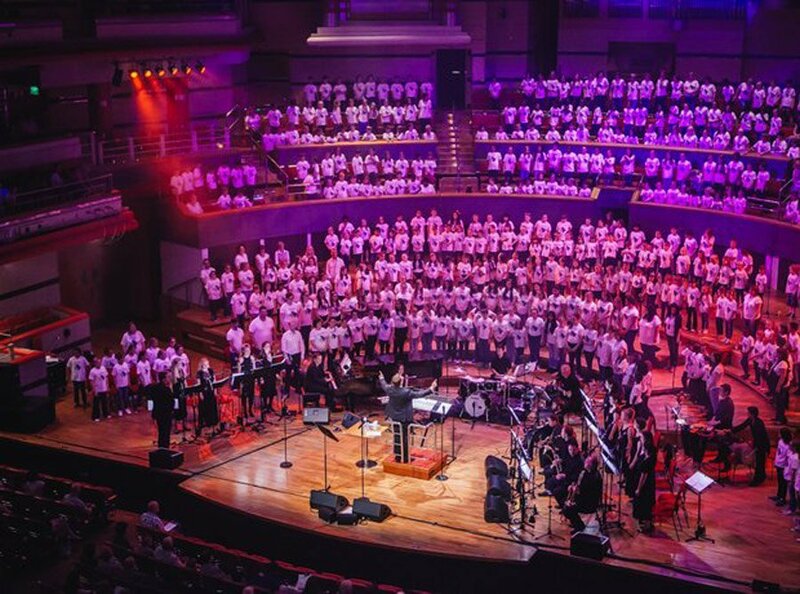 Royal Albert Hall: “Over 2000 children from over 100 AC Academies will come together at the Royal Albert Hall to perform a mix of songs, from The Drunken Sailor, to a Les Misérables medley and Carmina Burana, alongside a West End band. The concert will include a performance by children from Uniquely, the AC Academy’s dedicated SEN programme for children with special educational needs, who will sing a song they have composed themselves. Finally BBC Strictly’s Kevin and Karen Hauer will take to the stage to celebrate the launch of a new pilot project created in partnership with the AC Academy, dedicated to creating dance schools and dance school leaders (following a similar process to AC Academy’s renowned Choir Creation scheme).